(U.S. Senate)-U.S. Senator Jon Tester's popular Blackfoot Clearwater Stewardship Act picked up momentum in a Senate hearing on Capitol Hill today. 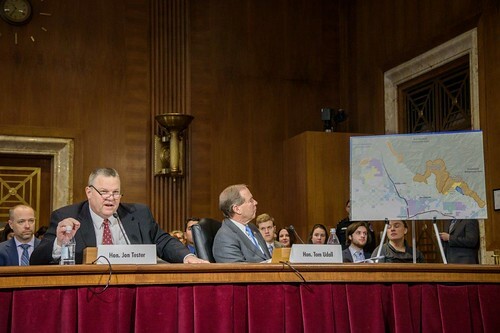 Tester made the case for his made-in-Montana, bipartisan forest management bill in front of the Senate Energy and Natural Resources Committee. Tester's bill was built through over a decade of collaboration from local ranchers, loggers, recreationists, and sportsmen and women. "This bill wasn't drafted in a backroom in Washington, D.C. or influenced by D.C. lobbyists," Tester said. "This bill was started over 10 years ago when folks worked with their neighbors and came to an agreement." Tester emphasized that the Blackfoot Clearwater Stewardship Act protects some of the last untouched landscapes in the lower 48. "Thousands of years ago glaciers cut through this valley to create one of the most special places in this country," Tester added. "God doesn't make places like this anymore and the folks who call this place home have decided they want to protect it for their kids and their grandkids." Those local collaborators praised Tester's persistence and leadership. "From the get-go we wanted the land and the people to speak," said Jack Rich, owner of the Rich Ranch. "We reached out to all of our delegation and to Senator Tester's credit he stepped up to the plate. We're optimistic that because it is a bipartisan effort that Senator Daines will step up and recognize the value of this bill, and make it a Montana, home-grown product that all of our delegation supports." "We are continuing to move forward, and we want to see the end result of our hard work," said Gordy Sanders, owner of Pyramid Lumber. "Public lands are a resource that is so limited," said Mack Long, a local outfitter and small business owner. "We have one opportunity and we have a very narrow window of time to step in and take actions that will protect these valuable landscapes. It's our obligation to make sure my grandsons and their grandchildren have the same opportunity to experience wilderness. It's up to us to hold our public lands together so that they have that opportunity." "It's time for the Blackfoot Clearwater Stewardship Act to move forward," said Connie Long, a local outfitter and small business owner. "Wilderness is almost like a church. You ride along in your horse or mule reflecting on your life and what is important to you, and why these special places matter. Every day I'm back there, my passion for wilderness grows." "We have a civic responsibility in the Blackfoot," said Loren Rose, CEO of Pyramid Lumber. "We need to be good stewards of the land. The land has provided jobs for all 140 of Pyramid's employees. We feel great commitment to the area, and addressing public lands on a landscape level just made a lot of sense to us a decade ago, and it still does today." "This whole, diverse array of people who have come together to form the Blackfoot Clearwater Stewardship Project is going to make the Blackfoot much stronger because of our efforts," said Jim Stone, local rancher. "We are all working towards the same goal." Protects 79,000 acres of land for the next generations. Fast-tracks future recreational trails proposals from the community, and authorizes the Forest Service to build any necessary trails. Opens up 2,000 acres of currently closed land to snowmobiling. Permanently protects access to 3,800 acres of mountain biking and trail recreation. Since 2009, Tester secured $19 million in federal funding to implement much of the restoration and timber harvest originally designated in the Upper Blackfoot-Clearwater Valley as a part of his Forest Jobs and Recreation Act. These investments created and sustained more than 100 jobs and spurred $33 million in new investment into the local economy. Last year, at the request of the Blackfoot Clearwater Stewardship Project and with the support of the local timber industry, Tester introduced his bill to implement the remaining recreation and wilderness designations that were included in the original forest management agreement between the local collaborators. You can access a map of the Blackfoot-Clearwater area HERE. You can download a one-pager about the bill HERE, and the bill text is available HERE.